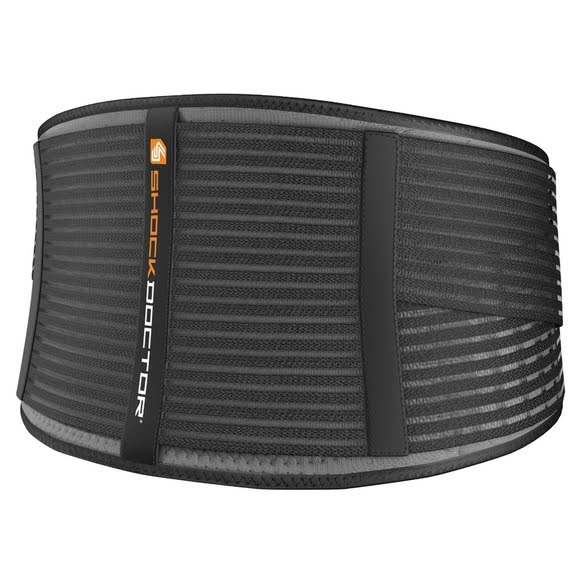 The perfect compression fit for all sizes, Shock Doctor's DLX Back Support stays firmly in place while you're on the move. This terry lined lumbar padding binds comfortably to the mid-section to provide great alignment and stability for lower back injuries. The perfect compression fit for all sizes, Shock Doctor&apos;s DLX Back Support stays firmly in place while you&apos;re on the move. This terry lined lumbar padding binds comfortably to the mid-section to provide great alignment and stability for lower back injuries. Easy-to-wrap adjustable compression compression/support straps. Terry lined lumbar pad and Lycra¨ binding for comfort and long lasting wear.